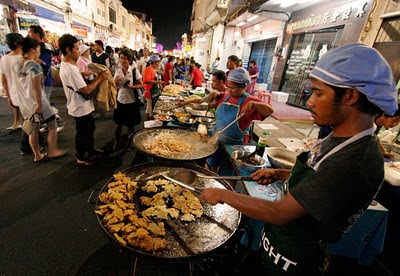 On Sunday evening there was another of these little-promoted local festivals in Phuket Town - although this one had been mentioned in the local news websites and judging by the number of foreigners I saw, the word had got out. 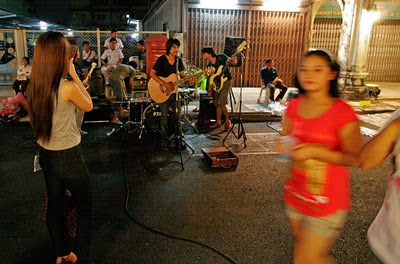 In fact there are meant to be live music events regularly in the old town. 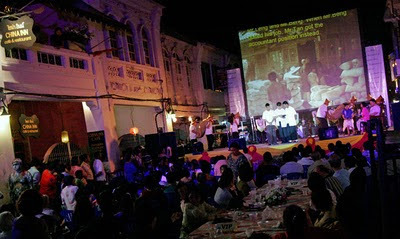 This event is organised by the Phuket Old Town Foundation, who I think do a great job of keeping the old town safe from development and making sure that Phuket keeps a sense of history despite the tourist invasion and huge developments in infrastructure are real estate in the last 15 years. 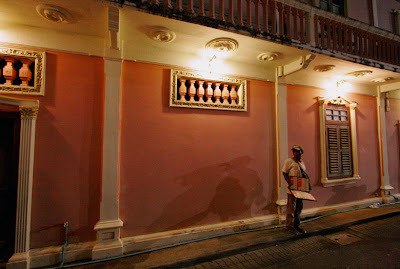 Some parts of Phuket Town really do retain an old world feel, which has been helped in recent months by work to remove all overhead cables along Thalang Road. The work has now been completed and Thalang Road, along with the very quaint Soi Romanee, is looking great. I think the area looked even better at night with many small bars and restaurants and all the street stalls and entertainment for this 1 night only festival. 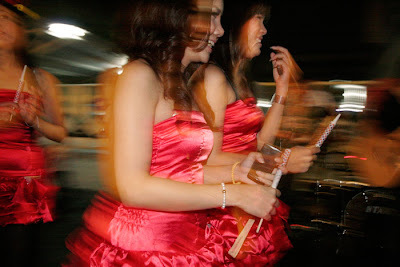 Part of Thalang road was closed to traffic for the night, and Soi Romanee was also made a walking street. I parked just north of Soi Romanee and headed down there first. There was live music at the Glastnost bar - see photo above, with many people sitting outside enjoying a cold drink. 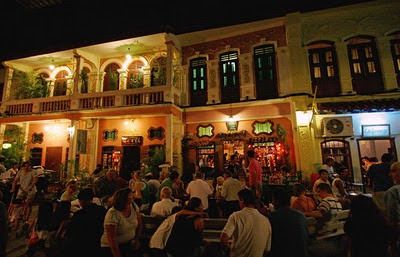 I have meant to visit this bar for ages, they often play Jazz music here and my parents (who used to go to Jazz clubs back in the 60's) made friends with the owner when they visited Phuket last time. 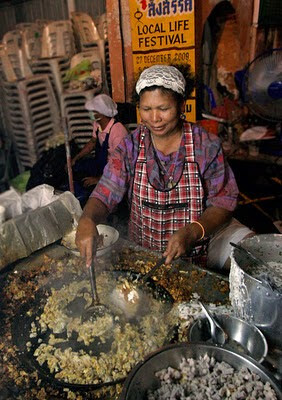 If you want to sample some local dishes, a street festival or a market such as the weekend market is a good place to find a huge variety of things to eat without having to spend more than 20 or 30 Baht for a dish. Hint - there is another fair starting this week - the Red Cross fair at Sapan Hin, in the south of Phuket Town is running until 9th January. 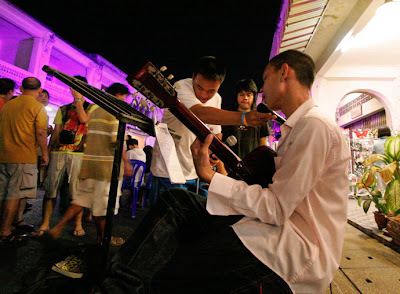 There was street entertainment along Thalang Road and plenty of happy faces. Festivals and markets are great for people watching and for photos - I was happy with the night photos here - taken with my EOS 20D and a 10-22mm wide angle lens with ISO set to 1600 or 3200 so no flash was needed. At the end of the street at stage was set up with a large screen - during the time I was there, a play was being staged with actors playing roles depicting the history of Phuket (and yes there is a lot of history here). I believe later there was also some music and dancing on stage. There were VIP tables in front of the stage for Phuket's great and good. 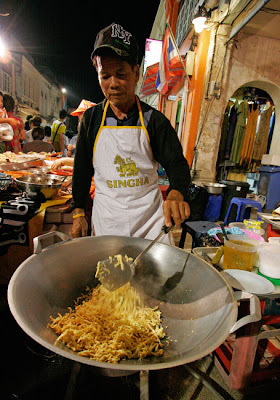 The aim of this blog has always tended to show the "other side" of Phuket - not the crowded beaches or bars but the local life, the quiet spots, the places that I like to go with the family. Hope this can continue in 2010 - things get busy during high season, so sometimes I have nothing to blog except maybe adding a hotel recommendation - would be nice to have more time, but that's not possible right now. Hope to do a few things after New Year that will be of interest to everyone... or at least someone. In the meantime, Happy New Year from Phuket!